The pink speckled trunk of a lucky Asian elephant at Elephant Nature Park. I will never forget the first time I reached my hand out and touched the pink-speckled trunk of an Asian elephant. Towering over me, this beautiful girl stood, flapping her large ears in the late summer heat of Thailand. She stood in front our little group of volunteers, all of us nearly speechless at our first elephant encounter, blinking her long-lashed eyes and curiously darting her trunk between our hands, searching for fruit. I spent a week with her, and 35 other elephants, at the 200-acre Elephant Nature Park, a place where elephants who are victims of the elephant tourism and illegal logging industries are able to live their lives out in peace, without ever having to do another trick, give another person a ride, or haul heavy timber to the point of collapse. The ENP is an elephant rescue and rehabilitation center in Northern Thailand. Here, you can volunteer and visit to help. The park provides a natural environment for elephants and other animals. At ENP, guests can visit for a day, overnight or volunteer for a week or more. Obviously, ENP hasmade a huge impact in my life and my writing. I have spent a lot of time since I returned to America in late September 2011 educating people on why they shouldn’t ride elephants and patronize other elephant tourist attractions, as well as informing readers on humane options that let people get close to these creatures without causing them further harm. Do you want to help save Thailand’s elephants? 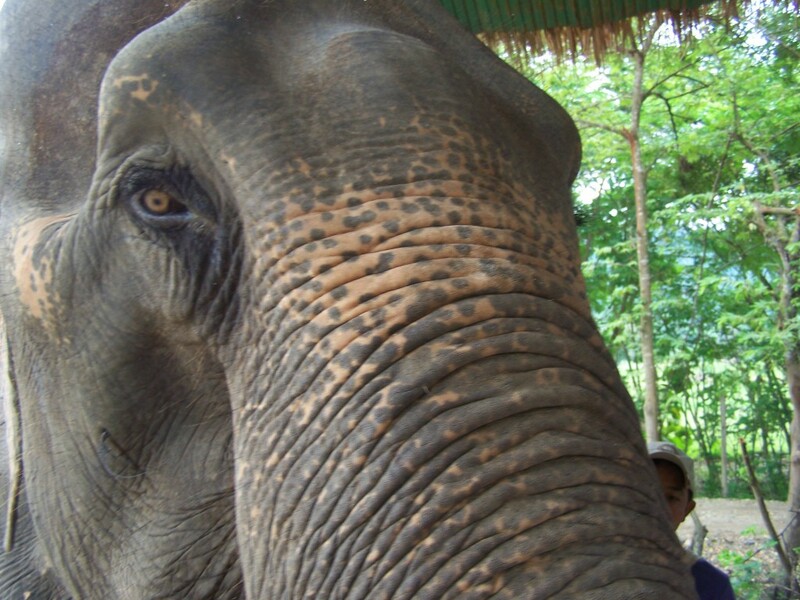 For details on how you can help Elephant Nature Park, please click here. If you know someone planning a trip to Thailand, tell them about Elephant Nature Park and the opportunity it provides. This post is a part of the ongoing Travel Bloggers Giveback series, a unified movement of bloggers giving back by posting stories about their favorite charity organizations. You can join the conversation on Facebook, as well as help spread the word by sharing this post, re-tweeting it and using the hashtag #tbgb, Stumbling and leaving a review and more. Help spread the word about all of these very special and worthy organizations. So good to read this Diana with practical ways we can support the welfare of elephants without exploitation! And eat at their delicious restaurant in Chiang Mai! Great story, Diana! I’ve never been to Asia, but on my safari in South Africa back in 2000 a massive bull elephant was the first big game animal we saw,. That encounter totally changed my life, and it was also where I first came up with the idea for GGT. Thanks so much for sharing the story of your experience at Elephant Nature Park, and for joining Travel Bloggers Give Back! Thank you for having me, Bret! Lovely story, thanks for sharing this. Absolutely!!! You know how much I am in love with ENP!! I could probably write an entire book on my experiences there. There is more to come, Daen! 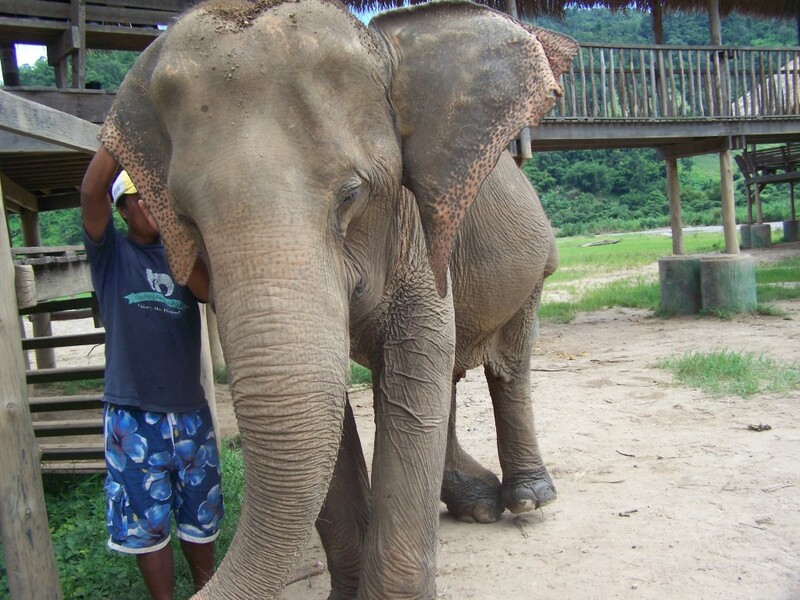 Great to read a little bit more about your experience at the Elephant Nature Park! Thank you, Adam! My time at ENP was magical. I wish that I could run off and volunteer with the elephants right now!!! God they are just so beautiful. What an AMAZING experience. One day, you can! Maybe we should plan a return trip to the park. I know I will be back there numerous times. It kind of got its hooks in me! Such a lovely face that elephant has. Looks like the eyes can see right through you. Isn’t she beautiful? I love them all! I love this article! I’ve always had a strange fascination with elephants and I’d love to volunteer myself! Volunteering with them gives you an even deeper fascination with them. They are so amazing to be with. I would definitely recommend it. I can’t wait to do it again! I love that you are so passionate about educating people about this. We stay away from places like this and I hope that other people will start to understand why it’s not a good idea to support them. Thank you! It is something that became really important to me during my time at the park and after. I would love it if readers could help educate others and so on so we can make an impact and send a message. Your passion for the elephants shines through! A thought – If we can’t travel to Thailand and the Elephant Nature Park we can surely look in our own home areas for rescue and rehabilitation opportunities. Absolutely! There are places around the globe that work with elephants. This is such a great post. I want to look into a giveback post. I was trying to visit Elephant Nature Park while in Thailand. I believe they ran a opportunity where volunteers got to work with the elephants in the park then bring them back to nature. It seemed so perfect. You’ve inspired me to sort it out and make it happen next time I visit Thailand, hopefully in 2012. Thank you! At the bottom of the post are details on how to get involved. Definitely a great thing to do as a travel blogger. 🙂 I have heard of this project — it is a really cool opportunity. If I could go back and do that, I would. I’ve been telling people I know going to Thailand about the elephants there based on your postings about them. Its really nice to see how passionate you are about these animals. I’m so glad you are on their side. What an endearing opportunity for you. Lordy how I love the internet! Just got back from volunteering in Costa Rica – loved it! But of course I am already throwing myself into planning my next trip – Thailand. I have been drawn to elephants ever since my first trip to Africa as well as to Thailand. So I decided to combine the 2 and discovered Elephant Nature Park, which I’ve been checking out. Then I ended up at Lonely Planet looking into rail travel in Thailand, they have a section of “Our Favorite Thailand Blogs” where I found you and eventually found this posting! TaDa! Really enjoyed your writing and your slant on traveling, will enjoy following you. That’s so cool how you found me! You will LOVE your time at ENP. Thanks so much for taking the time to let me know you enjoyed my posts. I will be writing a lot more on ENP in the coming months … stay tuned. And, let me know when you plan on being there!